Starting your swing in "one piece"—that is, by moving your arms, shoulders and club in unison—is universally accepted instruction. In my opinion, it's ruined more swings than it's helped, mostly by robbing you of the levers that create speed. You're much better off "segmenting" your move to the top, at least during practice. Follow the steps here—and watch the yards pile up. Set up to the ball normally, making sure to shake out your arms and wrists before gripping the club (tension almost forces you into a rigid, one-piece takeaway). Bend toward the ball, with your arms hanging freely, before flexing your knees. Now you're an athlete. Without moving anything else, hinge the club straight back with your wrists, keeping the back of your left hand flat and facing away from your body. It should feel like your right wrist is flexing backwards and up. Congrats! You've just added a speed lever. 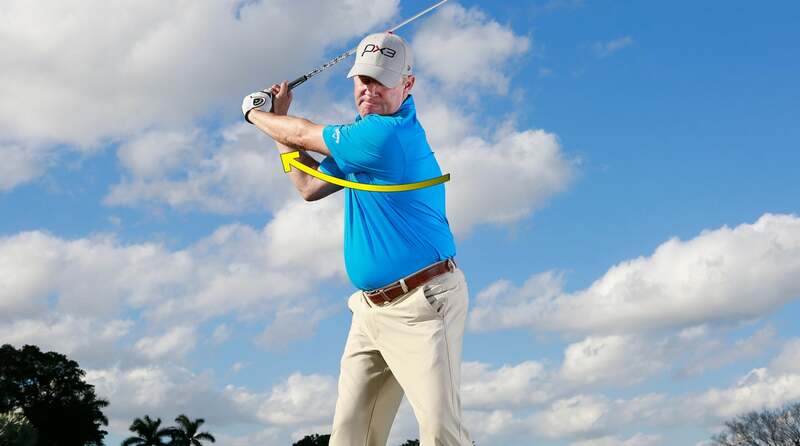 While holding the hinge established in step 2, swing your left arm back and across your chest, keeping intact the connection between your upper left arm and your torso. Allow the momentum of your arm swing to turn your upper body. Stop when your left arm is parallel to the ground. Now rotate. You're all set for a power-packed downswing. Practice these moves step by step, then gradually blend each segment until you have a full, fluid motion. You'll look—and feel—like a pro.